60 Comments	This post may contain affiliate links. 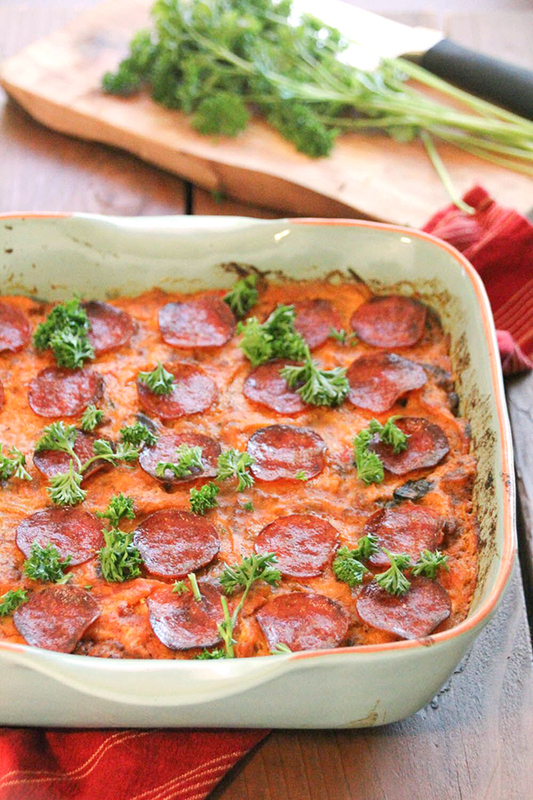 This Paleo Baked Spaghetti is loaded with veggies, but feels like comfort food. 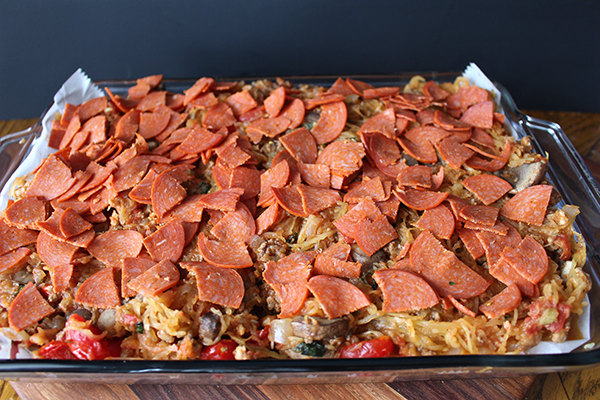 All the flavors of delicious spaghetti with crispy pepperoni on top- the best! Some photos updated July 2018- recipe is the same!! 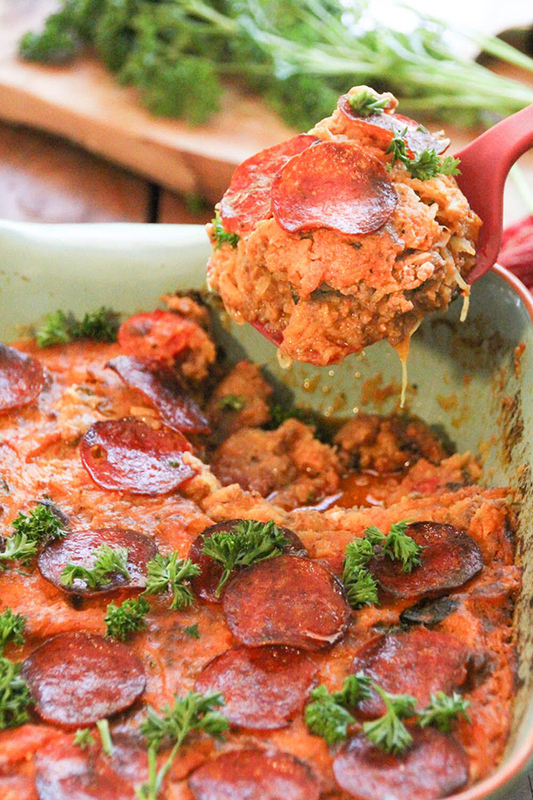 This Baked Spaghetti is amazing!! 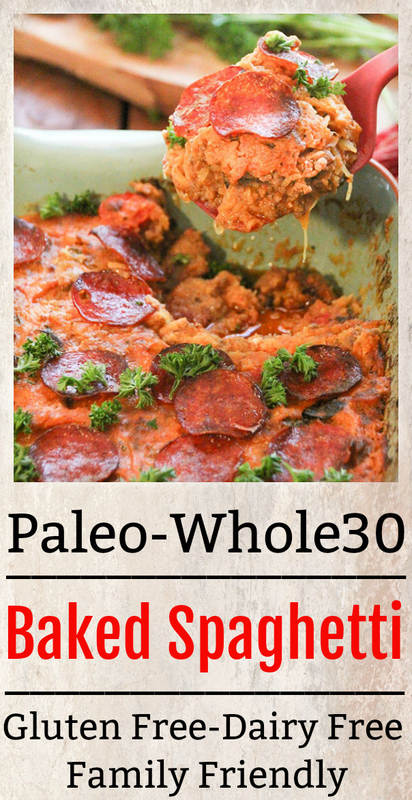 And to think its Paleo and Whole30- it seems too good to be true. 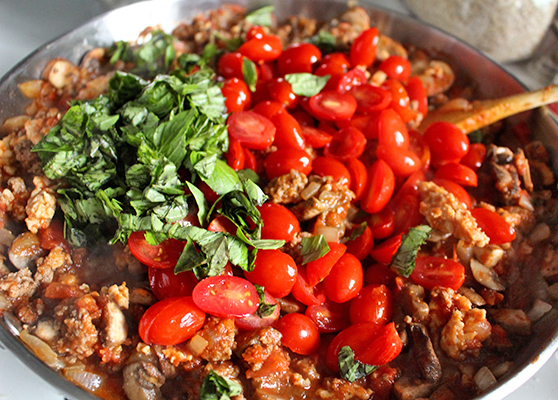 It has so much flavor between the italian sausage, pepperoni, and fresh basil. Eggs are added only to help bind it together- it is not eggy at all. This meal does require a little time to do all the cutting of the veggies and baking of the spaghetti squash. It’s totally worth it though. It’s a great meal to make on the weekend and eat all week long. If you are making it all at once, put the spaghetti squash in the oven then cut the veggies while it cooks. There are some tips below on how to cut down on prep time. Don’t know how to cook spaghetti squash or maybe you need a reminder? Click here for my step-by-step tutorial. After you cook the squash, let it cool, then ring it out with a clean kitchen towel. This gets rid of all the excess liquid and if you don’t do this the casserole will be watery. I did this while the onion and mushrooms were cooking. Here are the ingredients you’ll need. Yes, I use a jar of sauce. I know I could make my own, but this is nice when I’m not able to. This particular one has no added sugar or oil, so it’s Whole30 approved- and it’s delicious. 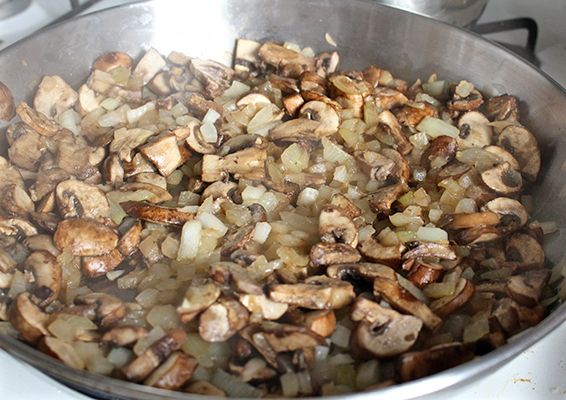 Add the mushrooms and onions to the pan with a little bit of coconut oil. Cook for 5-10 minutes, until softened. Add in the sauce and meat and stir to combine. Turn off the heat and add the tomatoes and basil. Add the spaghetti squash and eggs. I had to move it to a big bowl because I ran out of room. Typical. Pour it into the pan and top with pepperoni. I like to cut the pepperoni into quarters to have as many crispy pieces as possible. Bake for 45-50 minutes. 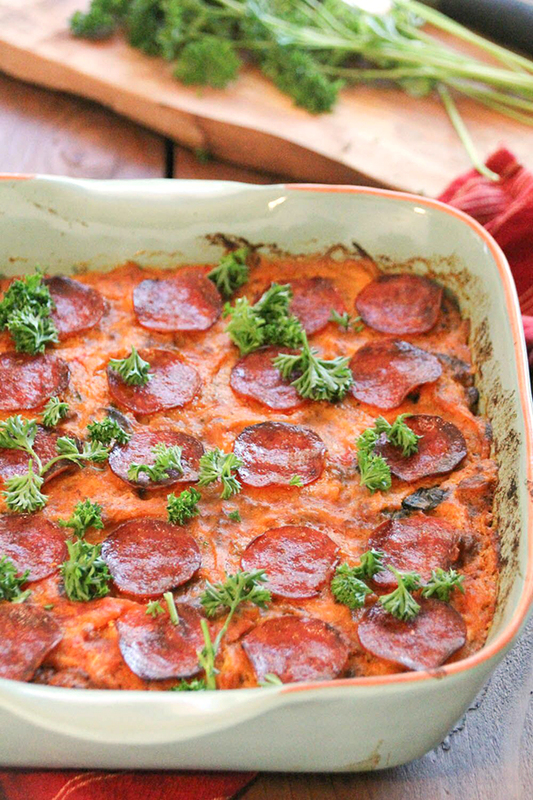 This Paleo Baked Spaghetti makes the perfect leftovers. It reheats well and makes dinner so easy. You will love it! 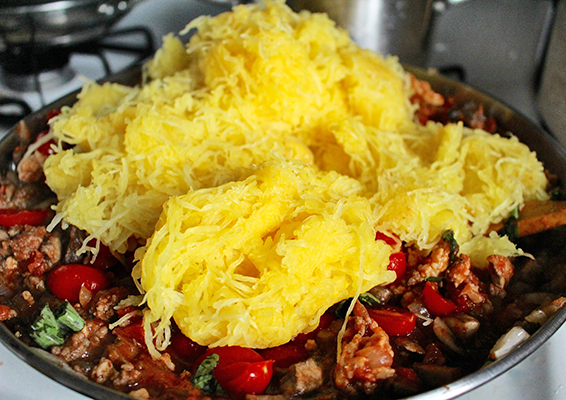 *Time saving tip* Cook the spaghetti squash in the Instant Pot while the veggies cook on the stove-top. 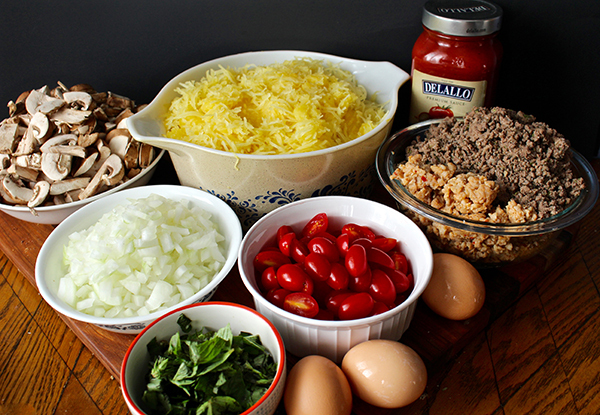 HERE is the guide for cooking spaghetti squash. Preheat oven to 350° and grease a 13x9- set aside. 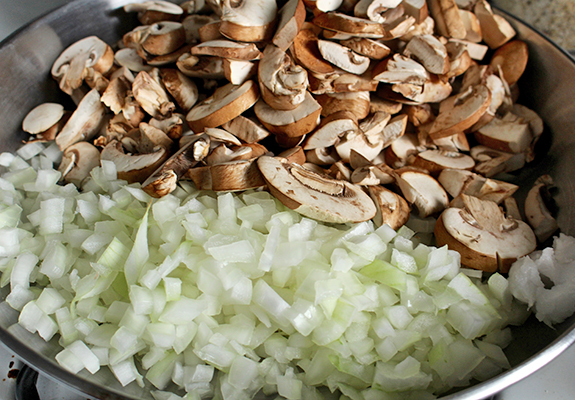 In a large skillet, add the coconut oil and cook the onion and mushrooms with the salt for 5-10 minutes or until softened. Meanwhile, squeeze the spaghetti squash using a clean kitchen towel. Ringing it in batches works best. If the meat is not already cooked, add it to the pan now and brown. 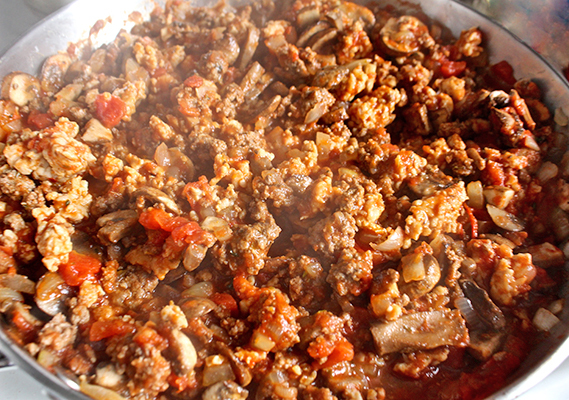 Add in the spaghetti sauce and mix well. Turn the heat off and add in tomatoes and basil. Dump into a large bowl (if your pan isn't big enough) and add in spaghetti squash and then the beaten eggs. Pour into the prepared pan and top with pepperoni. Love this recipe! Have you ever tried freezing it?? Hi Stacy- I have not, but people have frozen my other spaghetti squash recipes with success, so I think this would be the same. Hope you try it! Made this for the week of lunches. Delicious. What brand of sausage and pepperoni do you use? I’m having trouble finding I cured pepperoni and sausage without nitrates abs nitrites added. Pepperoni is hard to find. Applegate is the best brand but still not Whole30 compliant, so save for after that. Pederson’s is great sausage. Hope that helps! Are the eggs 100% necessary? I’m allergic. Hi Jamie- nope! You can leave them out. They just help bind the casserole together so it may be a little more watery. Enjoy!